Strong views and intense emotions came to the surface during yesterday's cabinet discussions on Brexit, according to reports across the papers. 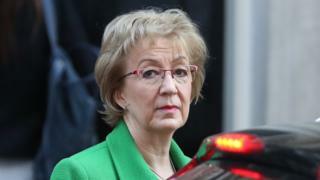 The Daily Telegraph says the Leader of the House, Andrea Leadsom, was "on the brink of tears" as she confronted mutinous Remainer colleagues who were threatening to resign. She is said to have accused ministers Amber Rudd, David Gauke and Greg Clark of "appalling and disloyal" behaviour as they forced the prime minister into opening the way for a delay to Brexit. One cabinet observer, quoted by the Financial Times, described Mrs Leadsom's attack on the three as "vicious". The prime minister, meanwhile, has written a piece in the Daily Mail urging MPs to "hold their nerve" and "do their duty" by backing her deal to leave so that the country can move forward. She insists progress is being made on securing changes to the Irish backstop - designed to avoid customs checks along the border - and that "a deal is within our grasp". The Daily Mirror thinks Mrs May is "cornered" and that "it's too late for this weak prime minister to take back control". Across the Channel, French newspaper Liberation believes Theresa May hasn't solved anything by raising the possibility of a delay - and that Brexit could still be "brutal". Spain's El Pais says she has given up her main negotiating weapon against Brussels - the possibility of an imminent no-deal departure. The actress Emma Thompson is on the front page of The Guardian. Like most of the papers, it prints excerpts from her letter explaining her decision to pull out of a film in protest at the appointment of a disgraced executive. She gave up her role in Luck last month after the announcement that the former head of Pixar, John Lasseter, was taking charge of the studio, Skydance Animation. He had left Pixar after admitting "inappropriate hugging" and "other missteps" towards female employees. In her resignation letter, Ms Thompson wrote: "I am well aware that centuries of entitlement to women's bodies whether they like it or not is not going to change overnight. Or in a year." A new Holocaust memorial is facing an unprecedented number of objections, according to the Times, with weeks to go before the planning application is considered by Westminster Council. The proposal involves digging up a small park to build a monument consisting of 23 tall bronze walls and an education centre, which would be partly underground. Critics say the development would obstruct views of the Houses of Parliament and threaten 100-year-old trees. Among those objecting are the International Council on Monuments and Sites, Historic England and Royal Parks. But more than 170 MPs and peers have voiced their support for the scheme. The Daily Mirror reports that criminals on probation monitored by private companies have killed 225 people in the four years since the part-privatisation of the service in England and Wales. The firms monitor low and medium-risk offenders. In comparison, 142 murders were committed during the same period by high-risk offenders monitored by the state probation service. Finally, a hotel has been branded sexist for offering men courses in laundry and other domestic chores. The Times reports that Rosslea Hall Hotel in Argyll and Bute advertises a "groom academy" where husbands-to-be can learn to iron, use a washing machine, make cocktails and prepare breakfast in bed. The deputy manager says it's "just a bit of fun".